The last part of the crankcase assembly is the cover on the back, or the flywheel end of the engine. First, I turned the inside of the cover where it will seat an additional ball bearing. I’ll be using a sealed ball bearing (2RS style) to serve double duty as an output shaft seal. Sealed bearings are grease filled and lubricated for the life of the bearing, but I’ll remove the inner seal and use the engine oil for lubrication, leaving the outer seal in place to prevent oil from leaking out of the engine. The next parts for the engine are the connecting rods. The big end will house a needle roller bearing, and the small end a bronze bushing. The first side is machined to the full depth plus a little extra to allow for the second side machining. The extra stock is milled off and the rods machined to final thickness. In this episode, I’ll be continuing the work on the crankcase by making the cover for the accessory end of the engine. I decided to make the gear cover as well, as I can use the same tools and similar set ups. A set of machinable soft jaws were installed in the vise and milled out for the second side operation. Another pocket was milled out in the soft jaws to finish the second side of the gear cover. The next part I’ll be making for the engine is what I call the cylinder block. The challenge on this part will be the O-Ring groove deep down in the bore and the space for the liquid cooling. The first picture is a sectioned rendering to illustrate how the finished part should look. I started with squaring the block on 5 sides on the Bridgeport. I then moved the work over to the CNC mill where the top side was faced over and two holes for the bores were pre-drilled. To rough out the two bores I used a long end mill and a helical interpolation. This is by no means the most efficient way when it comes to metal removal rate but it works very well with the long end mill. Another benefit is that it will produce the right size bore so it’s not going to take many passes with the boring head to get it to size. And bored out to finish size using a boring head. To relief the block for the coolant I used a T-slot cutter. The next operation was to mill a step to seat the sleeve. The last operation on the top of the block was to drill the holes for the cylinder head and coolant passages. The block is then turned over to drill the mounting holes on the bottom. The bottom “flange” is milled. And the passage for the coolant inlet is drilled. Last, the step on the sides were milled. This is a cosmetic feature as I needed a bit more length on the cylinder head but didn’t want to lengthen the crankcase. In today’s episode, I’ll be making the crankshaft. This whole engine is built around the crankshaft, and it’s design. It will be a test bed for future use of this idea. Please refer to Inline Twin Engine Ep. 1 for a CAD rendering of the crankshaft. The individual parts are turned on the lathe first. This will be the rear, the flywheel end of the engine. After all the parts are finished turned, it was over to the mill. I machined a set of soft jaws, to be able to hold the part accurately on the bearing seat. It is very important the hole for the crank pin is not only accurate in diameter, but also exactly perpendicular for everything to line up when assembling the crankshaft. Any misalignment would result in binding of the bearing. Two of the discs were drilled to be tapped, and two countersunk. I’m very pleased how free the crank is running. This part of the build has exceeded my expectations, and I can already envision this type of crankshaft in future engine builds. The first part I’ll be making, will be the crankcase. Alongside the crankshaft, the crankcase will be essential on proofing the design of the built up crankshaft. To better illustrate the steps in machining the parts, I’ll start with the CAD renderings of the finished parts. This will help to visualize the different setups. I started with the inside of the two halves, by milling out the pockets that will make room for the connecting rods. Next is the outside shape. First, I milled the flange where the two halves will be screwed together. Second operation was to mill the angled relief. The same process was used for the top half of the case, except one side is different where it will house the cam shaft. The two halves stacked on top of each other, to get the first impression of how this engine will look like. The next step is to bore out the case for the crank and cam shafts. The two halves are screwed together and set up vertical in the vise. Using a boring head, I started with the bore that will hold the camshaft. … and continued with the bore that will hold the crankshaft bearings. At this stage the crankcase was faced over, to ensure the surface is perpendicular to the bore, and the hole pattern for the cover was drilled. The operation was repeated on the other side, machining the case to its final length. The last operation was to drill and bore the top to finish the case. After the last couple engine builds were single cylinder engines, I felt it’s time to build a multi cylinder engine. I settled on a 2 cylinder engine of my own design. The unique part of the design is the built up crankshaft. The inspiration for the crankshaft comes from H. Schillings, a german model engine builder. It utilizes large, thin section ball bearings to register the different parts accurately. The idea is to have easy to make parts that will assemble to a strong, true running crankshaft. If this crankshaft design proofs to be successful, I already have plans to utilize this design in future engine projects. The goal for the engine will be to have a well running, slow idling engine. I set the compression ratio at a modest 5.5 : 1. This figure is a stab in the dark, as the compression ratio is a compromise between performance and idle characteristic of the engine. The slow idle is important to me, and I feel I can achieve what I’m looking for with the mass of the flywheel and crankshaft combined. The engine will be liquid cooled, requiring a full set up with pump, fan and radiator. As always, I’m looking to add tools to the shop, and recently acquired a Bridgeport Mill. In this post, I’ll share a few pictures of how I moved the Mill to my shop. To lower the center of gravity of the top-heavy machine, the knee was lowered all the way down and the head turned upside down. Once loaded on the trailer, it got a generous treatment with a roll of shrink-wrap. This will help keep the road dirt and grime off the machine. A set of chains around the bottom of the column was used to secure the machine on the trailer. In addition to the chains, I used ratchet straps over the top of the machine. I made sure none of the chains and straps are putting any load on the lead screw or ways. This secured the machine very well for the trip home. To offload the machine off the trailer, I got help from my friend with his skid steer loader. Bridgeport style machines can be easily lifted with the forks under the ram. First, we grabbed it from the side to get it off the trailer. A second setting from the front of the mill, with a couple of 4×4’s across the forks, to move the machine into the shop. 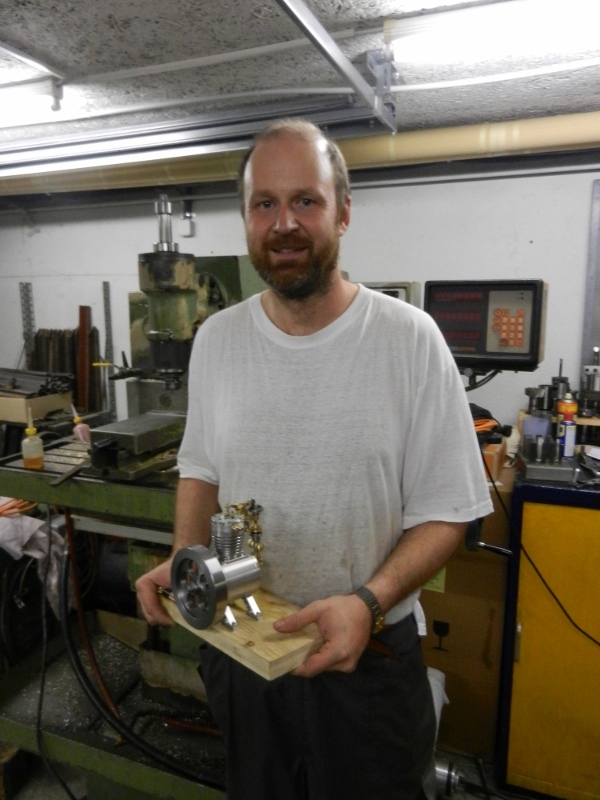 …and the machine in its place in the shop, next to the Maho mill. I hope this helps some of you, who are looking into moving a Bridgeport type mill or any other machinery to your own workshop. For other projects, please check out the projects page in the top menu. To continue the story of the SAM twins, we have to fast forward to my next visit to Switzerland, which was a little over a year later. The project remained more or less idle, as it was back to reality for the both of us. My brother did finished a few parts, like the crankcase pressure regulator and the fill plug. The wood boards for the engines were made by our dad, as he is the wood worker in the family. The box for the battery, I picked up at the local crafts store. Another addition to the engines was an oil level sight glass. Here, the two finished engines running next to each other for one last time, I was taking one of them home with me. The engine, as it is today in my shop. I occasionally take the engine out and let it run for a while. Every time I run the engine, it brings back the memories of the great time I had together with my brother in his shop. Now we know we have two running engines, and continue the work on the hit and miss governor and some of the finishing touches. The “trademark” 5 holes were added to the flywheels. Here a picture of our test set up on the bench, with the two engine side by side, and the finished flywheels installed. The last major part we needed to make, was the hit and miss governor. This was quite time consuming, as the governor is made up of a number of parts, all rather intricate. Unfortunately we didn’t take pictures while making the parts, so we will jump right ahead to the finished governor. The 10 days where up, and my visit was coming to an end. There were still a few little things left to do, but they will have to wait for another time. When we started, we really didn’t know how far this project would go, especially in the time frame we set ourselves. Having two complete, running engines was amazing. My brother, and yours truly posing with SAM for a photo. In the next episode, we’ll finish the story and complete the last few bits and pieces. We are getting really close to see if there is life in these engines. The last thing needed before a test run, is the valve train. These parts are very time consuming, requiring a number of different set ups. No CNC equipment in my brothers shop (at the time of this build. He has since added some new equipment to his shop). To make the radius on the parts, we used a fixture to hold it in the dividing head. …as the rocker arms needed the radii added. Now we have everything together, and are ready to give it whirl. And lo and behold, the engine fired right up on the very fist try! We where prepared to spend some time adjusting and tinkering, as on some of our previous engine builds, a considerable amount of fiddling was required to get them running. No need on this one, it ran beautifully. 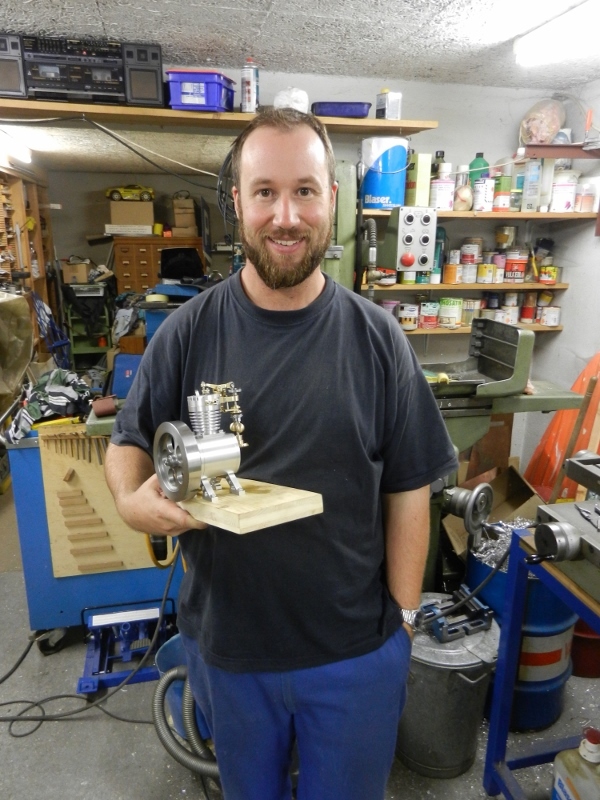 This was our first internal combustion engine we built. The excitement was enormous. This was at the end of day 8 of the project. Now we have two more days to finish the hit and miss governor and put the finishing touches on to the engines. For other project from my shop, see the projects page in the top menu.